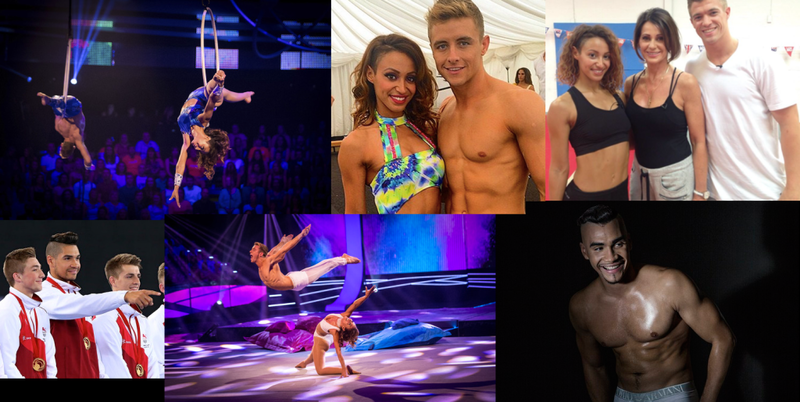 This week’s interviews are with: Amelle Berrabah, shown here with her pro partner, sports acro world champion, Doug Fordyce; Louis Smith who gives us the deets on his Euros disappointment; and Amelle’s coach David-Roy Wood who talks about what he learned from, no biggie, Nadia. It’s interview-o-rama today on the show! Louis Smith is here to answer your Book Club questions. Amelle Berrabah, the British singer and finalist on BBC One’s gymnastics tv show, Tumble, is here with her coach David-Roy Wood (who also coaches Princess Catherine). 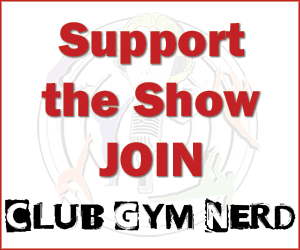 And by the way, Amelle is going to continue with adult gymnastics when the show is over because she loves the fitness results she’s achieved during training! To conclude, Jessica and Emma recap Tumble episode 5 before the big finale on Saturday where NADIA WILL BE PERFORMING! If he was every suspicious of his dad’s motives when he came back into his life. Exactly why he was so upset about not being named to the GB squad for Europeans and how he thinks it should have been handled. How he concentrated on training with Lisa Mason and Rochelle Douglas in the same gym and advice for asking out a teammate. What he would change about Tumble for next season. What they learned from Nadia’s surprise visit to their balance beam training session. About the training schedule and pressures of Tumble. Overcoming fear and doubt when there are millions of people watching. Find out more about BBC One’s Tumble on the official website. Watch full episodes on the BBC One YouTube Channel. If you are outside of the UK and want to watch Tumble on BBC One, you can use FreeTVCafe.net here. Use at your own risk. There are a ton of play buttons that will automatically download crap onto your computer. Be extremely careful not to click on an advertisement. Less risky is using a VPN like TunnelBear, Zenmate, GetUsVPN. I had sensible made-to-measure shoes as a child (Clark’s, for the UK readers), have never worn heels due to my post-gymnastics hypermobile ankles – AND I STILL HAVE BUNIONS. As a physical therapist I feel the need to comment on the whole safety of heels thing. For most people heels are not a good shoe to wear- they supinate your foot (raise the arch) and that takes away the foots ability to absorb shock and makes it harder to balance (never mind how thin/thick the heel actually is). But for some- especially those with naturally high arches, heels are comfortable shoes. Where a flatter shoe can actually be painful to wear. I’ve had several heated arguments with patients and their shoe choices and have learned to bite my tongue when someone comes in wearing heels and has high arches. I still recommend as little heel as possible- but everyone is different and for some- a very few some- heels are better.